We place great emphasis on the regular attendance of continuing-education courses and colloquia. 2009 ""The Art of Collaboration: Stained-Glass Conservation in the Twenty-First Century"" in the Metropolitan Museum of Art in New York, hosted by the ""American Corpus Vitrearum"" and the ""International Committee of the Corpus Vitrearum for the Conservation of Stained Glass"". With an expert presentation given by Anne Kaiser, Graduate Conservator, on ""Protection of conservation materials from photo-chemical aging"". 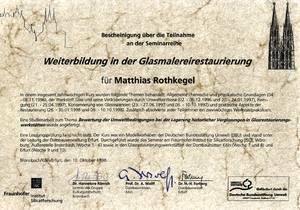 ""Glass and Monument Conservation"": a conference of experts hosted by the Bavarian State Office for Monument Conservation, in co-operation with Glashütte Lamberts in Waldsassen, with presentation given by Matthias Rothkegel on the UV-protective glazing on the choir loft's main window at the new minster in Würzburg, made as a leaded glass. Stained glass window techniques in the 19th century". Forum for the Conservation and Restoration of Stained glass Windows Namur, Belgium. The Comite Wallon pour le Vitrail (Wallon Stained glass Window Committee) in association with the Corpus Vitrearum of Belgium; the International Committee of the Corpus Vitrearum for the Conservation of Stained glass Windows; the Institut du Patrimoine Wallon (Wallon Heritage Institute). Historic glass-painting techniques. 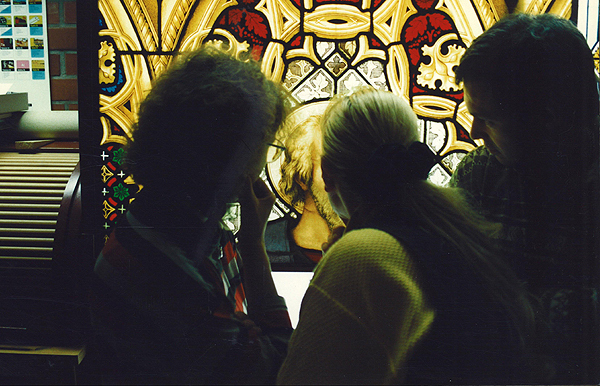 A practical and theoretical programme for conservators, monument conservators and glass painters. Training in painting techniques from the 16th century and the period between 1830 and 1880. Interim report on the DBU project "treatment of brown discolouration with hydarzine" on heavily-browned medieval glass paintings in the German Federal Agency for Material Research and Testing, Berlin. VII. Studio Dialogue in Potsdam, the computer & and digital photography in conservation. The cleaning of medieval glass paintings in the fine-stream process ("Air Brasive") – a method for conservation practise? On the problem of condensation-water collectors. 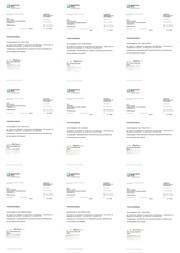 The project of brief inventory on glass painting of the 19th century in Saxony-Anhalt - an interim report. 2000 Development and application of model methods for the protection of nationally-valuable glass paintings in Saxony and Poland – primarily from the 19th century – from negative environmental influences. Concluding event hosted by the German Foundation for the Environment, under direction of the working group for glass-painting research at the CVMA, Potsdam; in co-operation with the German in co-operation with the German Federal Agency for Material Research and the Fraunhofer Institute for Silicate Research. Model removal of environmentally-induced damage to the nationally-valuable inventory of historic glass windows in the Gothic building Haus Wörlitz. The partially-reconstructed glass paintings in the Salvatorkirche (Munich) prior to their re-installation; a colloquium hosted by the Bavarian State Office for Monument Conservation in the exhibition hall at the Mayer`schen Hofkunstanstalt. IV. studio dialogue in Potzdam, the project by the German Foundation fort he Environment;St. Gotthard-Kirche, Brandenburg, Window NIII and sIII. Analyses and effects of second firings on glass paintings of the 19th century. 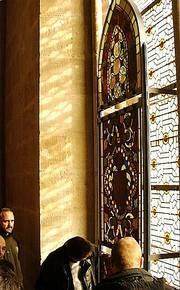 Problems and solutions in the installation of the protective glazing. Inventarisation of glass paintings of the 19th and early 20th centuries in the churches of Mecklenburg-Lower Pomerania. 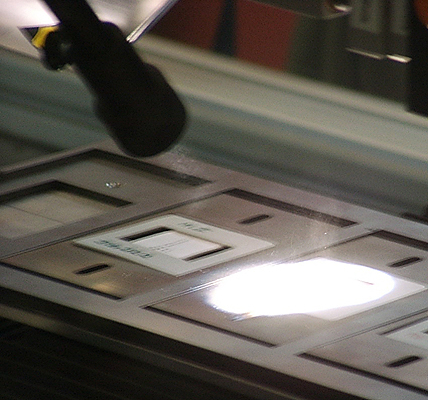 1999 Laser cleaning of historic glass paintings – Interim results o a research project conducted by the University of Applied Sciences at Münster, the Friedrich-Alexander University of Erlangen, the Cathedral Construction Administration in Cologne and the Cathedral Construction Office in Erfurt. Funded by the German Foundation for the Environment, at the Bronnbach monastery. 1998 Abbr. 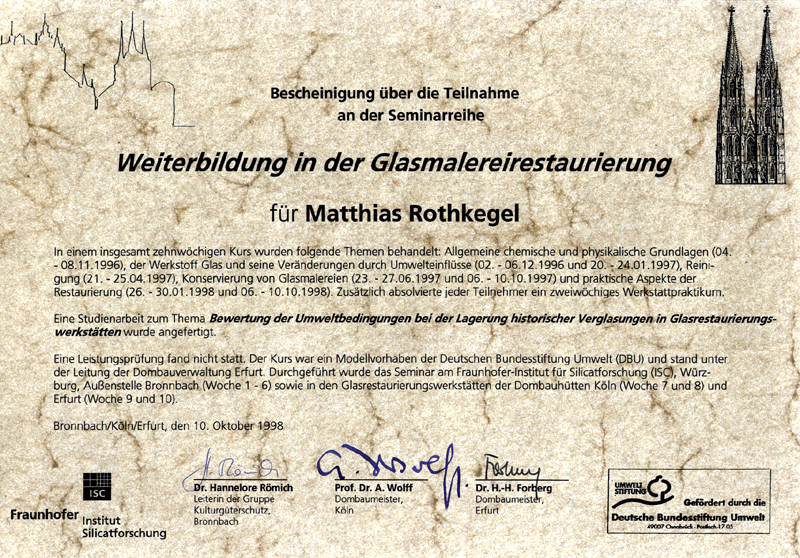 title "Continuing education in glass-painting conservation", funded by the German Foundation for the Environment, in co-operation with the Cathedral Builders' Lodge in Erfurt, the Cathedral Builders' Lodge in Cologne and the Fraunhofer Institute for Silicate Research (ISC), Working Group for the Protection of Cultural Possessions, Bronnbach field office. 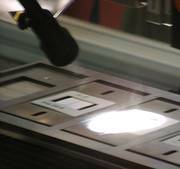 In the context of this seminar, a paper on: "Evaluation of Environmental Conditions in the course of the Storage of Historic Glazings in Glass-Conservation Studios". 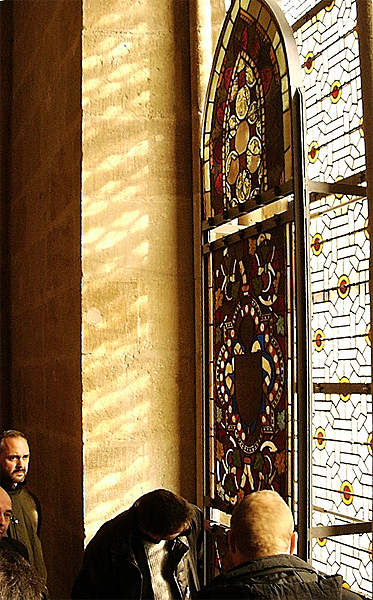 Interdisciplinary continuing education for mid-sized glass-conservaiton companies, practise-oriented preservation measures for historic glass windows damaged by environmental influences (planned model project). Foto-/Computer documentation – the possibilities and limits of analogue and digital photo documentation for glass paintings and articic glassworks", German Centre for Craftsmanship and Monument Conservation, Propstei Johannesberg, Fulda e.V. 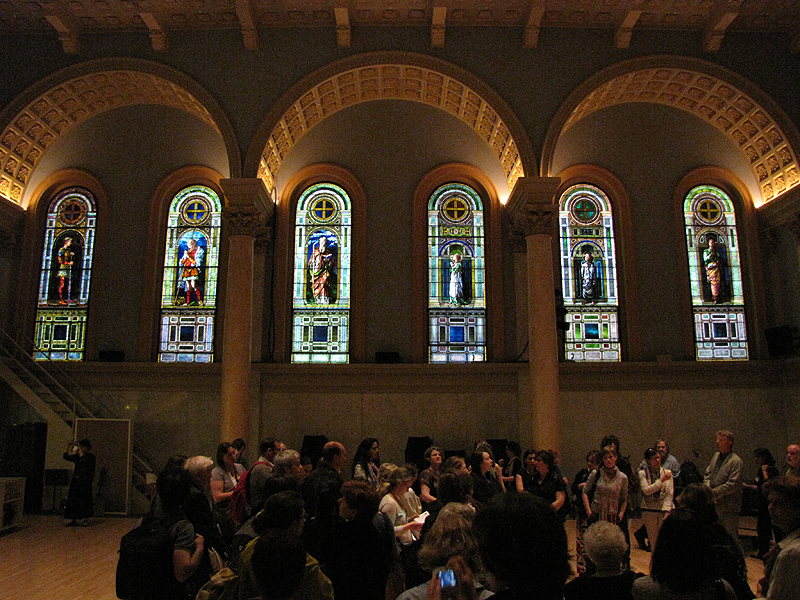 Excursion in the context of the conference ""The Art of Collaboration: Stained-Glass Conservation in the Twenty-First Century"", here in the Judson Memorial Church on Washington Square in New York (2009). Experts' discussion in the Cathedral Builders' Lodge Cologne during the 10-week-long DBU continuing-education programme on glass-painting conservation. 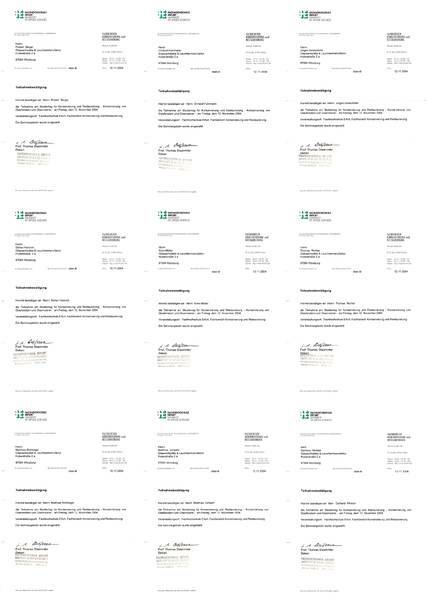 The participation confirmations for all participants from our company, at the Study Day hosted by the University of Applied Sciences at Erfurt (2004). 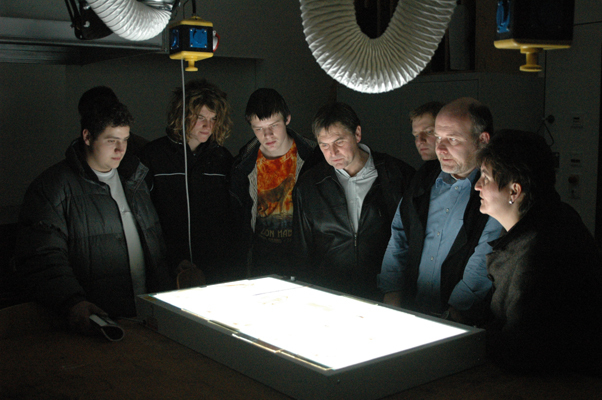 Visit at the conservation studios during the Study Day at the University of Applied Sciences at Erfurt (2004). 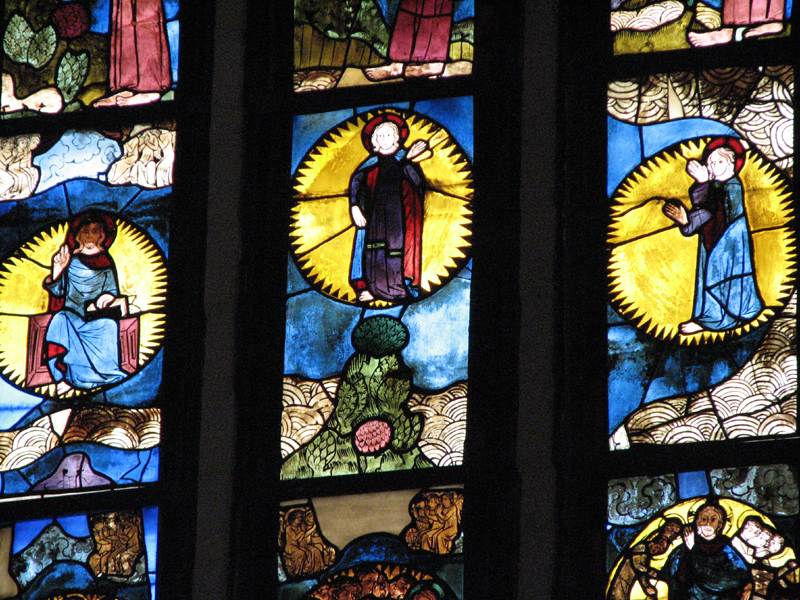 Laser cleaning of historic glass paintings – interim results of a research project conducted by the Laser Centre at the University of Applied Sciences at Münster, the Friedrich-Alexander University of Erlangen, the Cathedral Construction Administration in Cologne and the Cathedral Construction Office in Erfurt. Funded by the German Foundation for Environmental Conservation. Concluding discussion at the re-dedication of the conserved 111 medieval fields of the three choir-loft windows at the St. Marienkirche in Frankfurt (Oder). Concluding event for the DBU project in Meissen. Glass paintings as a whole object – history, technique and methods of reconstruction and supplementation. Troyes, France.